HEADSETS WITH "PASS ALONG" OPTICS HAVE ALREADY BEEN BUILT USING REMOTE IMAGING FROM A DUPLICATE SIZE VERSION TO THE SONY 1OK. SCOTT DOUGLAS-REDMOND HAS PRODUCED A SYSTEM WITH TWO OVERHEAD, OR SIDE AREA, 2K/4K/6K/10K LINE RESOLUTION ULTRA-HD MONITORS WHICH HAVE THEIR CRYSTAL CLEAR IMAGES DELIVERED TO YOUR VR GLASSES VIA FIBER OPTICS. SAID SCOTT: "EVERYBODY IS GETTING TIRED OF WAITING FOR THE DISPLAY MANUFACTURERS TO DELIVER 6K, AND HIGHER, LCD'S. WE CUT TO THE CHASE AND BROUGHT 6K+ TO YOUR EYES ANOTHER WAY. LAS VEGAS, NV — Sony demonstrated a prototype of its 8K display with a peak brightness of 10,000 nits at CES 2018. The company did not disclose when it plans to commercialize the product, if at all. While the display’s main feature is extremely high luminance, it packs a bunch of other important technologies, including a new SoC and a new method to keep the contrast ratio high. Sony calls the prototype it demonstrated at its CES 2018 press conference the “X1 Ultimate Full-Spec HDR 8K Display”. 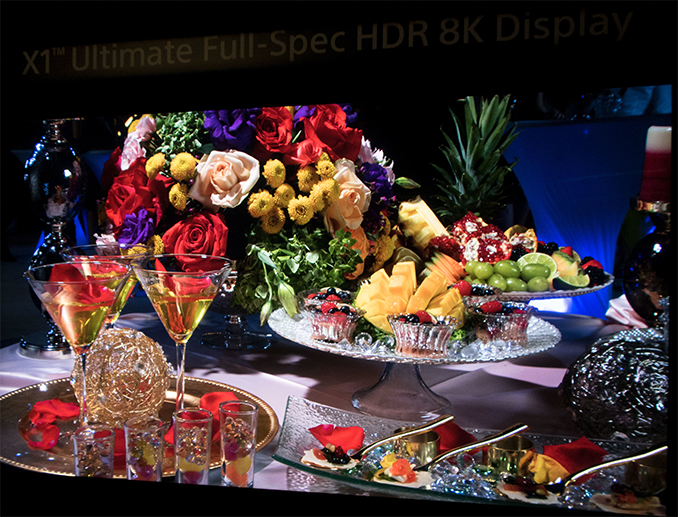 The 85” device with a 7680×4320 resolution relies on an unknown display technology and an undisclosed backlighting system to enable a peak luminance of 10,000 nits. To put the 10,000 nits number into context. Contemporary high-end UHDTVs offer peak brightness at 1000 – 1500 nits; to get the Ultra HD Premium logo on a TV, the device should have a peak luminance between 540 and 1000 nits (subject to black level performance) and VESA’s DisplayHDR certification currently tops at 1000 nits (black level performance has to be met to get the badge). Then, there is Dolby’s Pulsar reference monitor for Dolby Vision post-production with a peak brightness level of 4000 nits. So, 10,000 nits is a lot. In fact, the Dolby Vision specification supports maximum luminance of 10,000 nits. A big question is whether this is something that is eagerly awaited by the industry in the foreseeable future because in addition to peak luminance, display panels need to properly support large color spaces, but clearly this is Sony’s technological achievement. It's interesting to note though that while the most eye-catching aspect of the prototype set is its brightness, that's not the only reason Sony is showing off the set at CES. The display is also a vehicle to show off the company's latest X1 picture processor, in this case being equipped with a pre-production version of Sony’s X1 Ultimate processor that features two times higher “real-time processing power” compared to the current-gen X1 Extreme. The latter is known to support multiple HDR-branded video post-processing techniques, so it is logical to expect its successor to further develop such capabilities. While high luminance and a wide color gamut are important, contrast ratio is a yet another factor required for a stunning picture on a screen. 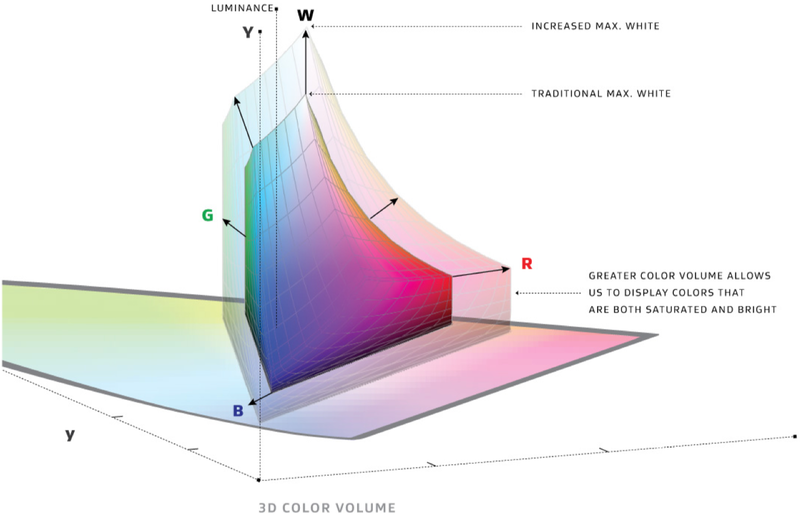 When it comes to displays with LED backlighting (and I doubt that we are dealing with an OLED-based prototype), precise control of LEDs and calibration of their light beams is a method used by manufacturers to achieve deep blacks today. Several years ago, Sony already demonstrated a 4K display with a 4000-nits brightness featuring its Backlight Master Drive technology that ensured both incredible luminance and a high contrast ratio with its 1000 independently controllable lighting zones. Since technologies tend to evolve, we may be looking at a successor of the Backlight Master Drive tech to be used on the "X1 Ultimate Full-Spec HDR 8K Display”, but a linear growth of the number of controllable lighting zones is hardly the only option that Sony has at hands. Sony naturally does not disclose any additionally technical details about its prototype. As such, the key takeaways here is that the company had developed an ultra-bright backlighting along with a way to keep the display’s contrast ratio at a decent level as well as a processor that can handle content with peak luminance of 10,000 nits and presumably in a wide color spectrum.